Thank you so much for your kind interest in my artwork. During my many years as a fine artist, art director and graphic designer, several significant events and career choices have contributed to my love of the heart-warming "AMERICANA" style. For most of my career, it's been my signature genre ~ although there is a handful of contemporary creations from the 1970s and 1980s still floating around. A couple of these more modern pieces are hanging in my youngest brother Bob's home. Every time I visit his family and see these works, I am amazed at where my artistic efforts have taken me over the years. As much as Bob loves my contemporary art, I'm glad I embraced, developed and refined my style in the direction I did. This unique genre has brought me decades of joy and personal satisfaction ~ and many friends and patrons along the way. Below I've highlighted several of the milestone events that helped shape my career. Sister Rita Mae Fischer (pictured above with my first grade class) noted on my report card, “She loves artwork of all kinds and is a tireless worker." It is amazing how true that statement still is today. Our beloved teacher (now nearly 90) is thriving at the Franciscan Sisters' convent in LaCrosse, Wisconsin. I am still in touch with her. NOTE ~ Find more information on this inspiring woman further down on this page under the "Patti Simpson Ward in the Press" section. Highlight ~ In summer 2016, Spokane celebrated the Franciscan Sisters' 100 years of dedicated service to the community and surrounding Inland Northwest. Dozens of alumni from Marycliff High School and other parochial grade schools in our community once staffed by the Franciscans filled Saint Augustine's Church for Mass and a wonderful reception afterwards. The event was truly "standing-room-only" ~ a beautiful tribute to these dedicated religious educators. 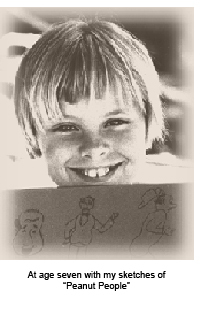 GRADE SCHOOL YEARS ~ More often than not, I remember drawing, writing and pasting up my own magazines, newsletters and booklets at the desk in my bedroom while my brothers and sisters were out playing with neighborhood pals. "Creating" was always my heart's desire. LATER YEARS ~ Saint Augustine's grade school pal Maggie McCarthy and I have always stayed in touch. She was my best friend from first grade through the sixth grade ~ and I love her. Maggie met and married her husband Wayne Braueur decades ago aultimately moving to Alexandria, Virginia, but every once in a while she comes back for a visit to Spokane ~ not just to see me, but to check in on her cousin Molly Roberts Hannan who lives nearby (more on Molly below). On a recemt visit, Maggie brought several "butterfly" books I created for her when we were in our twenties living in Western Washington. What memories! When this picture was taken in 1957, Uncle Ed Flemister (my father's only sister's husband) was vacationing with my Aunt Wanda and cousin Jim at our family cabin at Hayden Lake, Idaho. Ed was taking a much needed break from piloting a small air craft for Bethlehem Steel in Venezuela, South America. When not flying his plane, Ed spent a great deal of his free time painting with oils, sketching with charcoals and experimenting with photography. Ed always had a dark room wherever he lived. On the rare occasions when the Flemisters visited us in Spokane, I begged for art lessons ~ thus this "Peanut People" photo to the left. TWO FINAL EXHIBITS ~ In January 2009 when Ed was in his mid-nineties, he exhibited his huge personal art and photography collection in a downtown Baker City, Oregon art gallery. In 2010, he moved to Tampa, Florida to be closer to son Jim's family. Four years later, the Tampa Public Library hosted a large exhibit of his work. The Tampa Tribune published a glowing article honoring his talent, enthusiasm and zest for life. In January 2015 after a creative, adventure-filled creative life, Ed Flemister passed away at 98. He had just celebrated the Christmas holidays with his extended family. On Facebook, Todd Flemister recalled his grandfather as being "one of the most fascinating people" he had ever known. Always a unique individual, Uncle Ed's passing truly felt like the end of an era. We all miss him. In late October of my sixth grade year at Saint Augustine's Grade School, my family moved from Spokane's South Hill to the suburbs of Spokane Valley. Our new neighborhood was called Kokomo and was filled with ranch style ramblers and mid-century moderns. Ours was a mid-century modern. My mother's "dream house" had been featured in Sunset Magazine and she couldn't wait to move in. 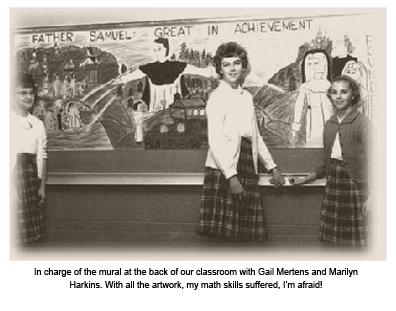 At Saint John Vianney School, more often than not I was at the back of the classroom drawing murals with pastels on butcher paper while other classmates were learning long division. Math can still be a challenge sometimes ~ especially during income tax time. 10 YEARS OF CAMP FIRE ~ As a Camp Fire Girl for over ten years, I earned many art-related awards. This spawned a summer job between my freshman and sophomore college years as a counselor at Camp Dart-Lo north of town on the Little Spokane River. I taught crafts and dramatic arts. Sharing ideas with the kids was a rewarding way to spend the summer months. I'm pretty sure I learned more from my little charges than they did from me. My campers' most creative project? Elaborate mobiles created with fishing wire and fluttering Origami birds folded from chewing gum wrappers. HNA & FWC ~ During high school years at Holy Names Academy, I enrolled in basic and advanced design classes which included invitations to weekend workshops at Fort Wright College. My parents ~ especially my mother Sally ~ always encouraged me. I had not found my niche yet as most of my creative efforts were still of a contemporary nature ~ but the ONE thing I knew for certain was that I wanted a career in art. Highlight ~ At the summer 2013 Holy Names 125th Anniversary Celebration, I reconnected with the woman who encouraged and influenced me the most as a young art student. Sister Shirley Mallory (Justin Mary) taught the fundamentals of design ~ but always stressed being true to your own creative passion. As you can see by this photo, both of us enjoyed our heartfelt connection that summer. I was so grateful to have had the opportunity to thank her in person for everything she taught me. Sadly, this very talented educator passed away just months after our reunion at the convent. 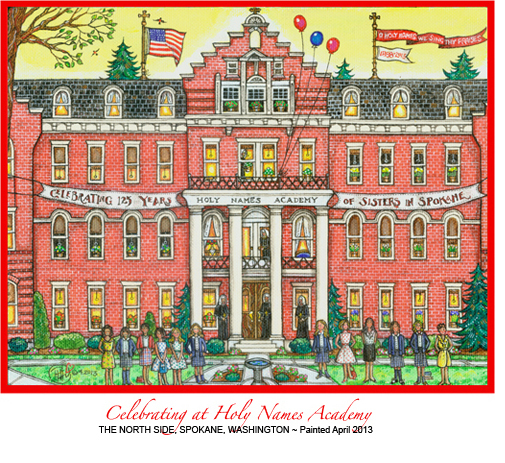 You'll find more about the 125th anniversary festivities in the "The Holy Names Sisters" section below. EWU ~ When I attended Eastern Washington State University, it was still a college. During my time there, I designed the graphics for a friend’s winning campaign for student body president. John Allen went on to create "Vino," a very successful Spokane wine shop. A couple years later, The National Syndicate Advertising Agency commissioned me to sketch 50 pen & ink sketches for a year's worth of print ads to sell cars with an "All American" theme ~ my first commercial design project. Highlight ~ In Seattle, I moved in with my youngest sister Peggy after wrapping up the National Syndicate project. While driving up Aurora Avenue, I was amazed to see one of the ads I created on large billboard above the highway. With EWU and the design project behind me, Peggy and I lived together with a group of women students in a couple of big houses (one a Cape Cod and the second, a Foursquare in the University of Washington District. These homes are pictured in the painting I created for my sister when she married her sweetheart Jeff Barton in 1976. Find the "The Peggy Places" painting near the top of my Commission page. Some of these roommates were students at the university and others worked for nearby businesses. I got a job in at the flagship store for The Bon Marche (eventually absorbed by Macy's) as a sign-maker, graphic designer and ulitmately director. Two life-changing events occurred. I received a coffee table book of Grandma Moses Christmas-themed paintings and I discovered Charle's Wysocki's primitive artwork in a very early edition of his "Americana" Calendars. Wysocki's calendar was tacked to house-mate Dawn Tannerberg's bedroom door. 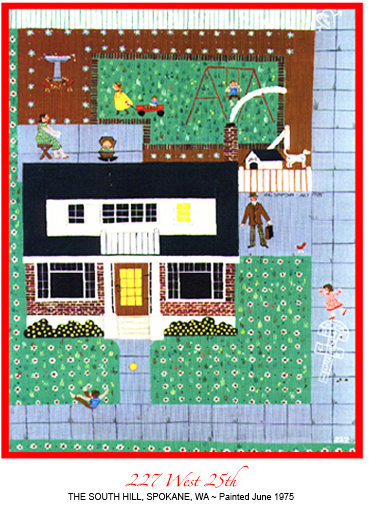 I was intrigued by Grandma Moses' warm family-friendly paintings and Wysocki's attention to detail in his New England-inspired imaginary settings. My dream was to try my hand at painting portraits of actual settings in this "Americana" style. To the right is one of my first works from 1975 picturing our old South Hill home, the Codd House. This piece is part of my personal collection and reminds me where I was when I began my fascination with "Americana." NOTE ~ Another early portrait of this home (I've done five) is part of "The Peggy Places" (mentioned above) on my Commission page. In the mid-1970s, a Bellevue gallery hung and sold several very early pieces similar to this one. Later in the 1980s, my expanding collection was featured for a couple years in Kirkland's Art Walk District. Years passed and I continued to refine my style. I added more perspective for depth and focused even more on all the details that I found essential for telling the personal story of a client's home or a beloved landmark. I also designed an icon for my signature which I still use today ~ my name with a circle around it and a red heart. I began taking my camera with me everywhere so I could shoot photos the moment anything caught my eye. This was a bonus when my sister Marilee and I visited Port Townsend's Tour of Historic Homes in the late 1970s. That trip inspired over a dozen paintings (Port Townsend Collection pdf) of the vintage Victorians there. Now I use my iPhone and can "air-drop" images into my MacBook Pro immediately. Digital media has truly changed our world! In the late 1980s, I traveled to the U.S.S.R. with two-dozen associates from varied professions, including media consultants and motivational speakers. Destinations included Moscow, St. Petersburg and Seattle's "Sister City" at the time, Tashkent. While in Tashkent, I made friends with several women including an educator, a medical student and a museum curator. The introduction to the art curator proved to be fortuitous, as with the help Seattle Mayor Charles Royer Russian-born wife Tatiana, she arranged to have two of my Tashkent-themed paintings displayed in the National Art Gallery of Tashkent. One is here and the other on my More Collections page. 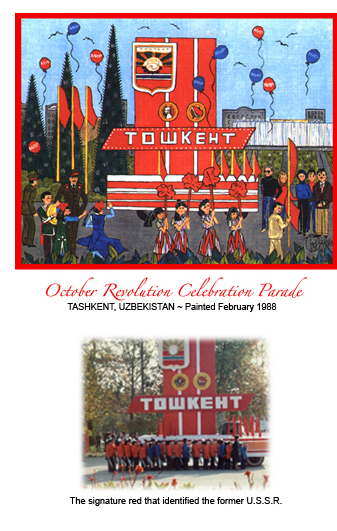 The "Sister City" relationship between Seattle and Tashkent was a natural fit because the climate and personality of Tashkent and Seattle were very similar. Far south of the government seat in Moscow, Tashkent felt much more open and relaxed. Highlight ~ Visiting the Soviet Union changed my life. It opened my eyes to how lucky I was to have been born in the United States. The U.S.S.R. was stunningly beautiful and the people incredibly hospitable thanks to Gorbechov's "Peristroika" movement at the time. Much of the U.S.S.R. was a culture and history-lover's dream, but the trip made me grateful for the priceless freedom and opportunities we enjoy here in the United States. 25 YEARS OF CALENDARS ~ To dovetail with my exhibits and events (and to placate family members who had received one piece of artwork too many), my sister Marilee suggested I design a calendar to include 12 NEW pieces of artwork a year. 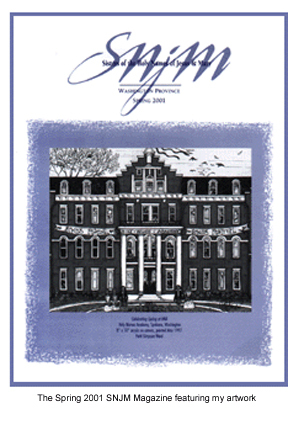 Highlight ~ The image to the left was the cover of the first edition ~ yes, once again featuring a portrait of the beloved Codd House completed in 1993. In 1994, I initially had about a dozen printed. This year, with my three 2019 25th Anniversary editions, I've sold hundreds, shipping them all over the United States and beyond. A handful of clients have collected them since the very first one. Amazing! Over the years, I've found that many of us who grew up in the Pacific Northwest (especially Spokane) have very special memories of this family-based city with a small town feel. The parks, beautiful old neighborhoods, landmarks, nearby forests and lakes provide the folks who live here with a wonderful quality of life. Find previews of three current 2019 25th Anniversary editions featured in detail on the Calendar page of this website. SPOKANE'S BROWNE'S ADDITION & THE FIRST "ARTFEST"
In 1997, the Eastern Washington Historical Society invited me to exhibit at its first outdoor art festival ~ today known as "ArtFest." Coeur d'Alene Park and Browne's Addition comprised Spokane's oldest residential neighborhood. It was filled with mansions that were designed for Spokane's wealthy timber, mining and railroad businessmen. Many of these beautiful vintage structures are still standing, although many were divided into small apartments to accommodate returning World War II veterans in the late 1940s. Today, there is a movement to restore many of these back to the status of single-family residences ~ a wonderful thing! At the first ArtFest in 1997, I exhibited 18 works of fine art, including portraits of three well-known residences designed by renowned architect Kirtland K. Cutter ~ the Patrick Clark Mansion, the Wakefield House and the Amasa Campbell House. 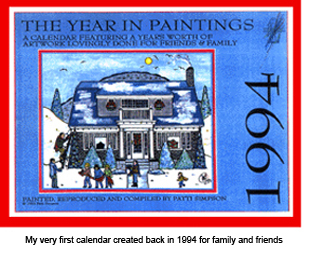 My 1997 "Pacific NW Memories" calendar did very well and introduced my fine artwork to Spokane for the first time. The Amasa Campbell House served as the Cheney-Cowles Museum until the Northwest Museum of Arts & Culture (The MAC) complex was completed. This allowed restoration to begin on the historic mansion which had been donated to the community by Amasa Campbell's wife, Grace. Amazingly, K.K. Cutter's sample book was discovered in the servants' linens room in the attic ~ ensuring a truly authentic result to the project. I've completed Browne's Addition Collection pdf) ~ the most recent piece, a NEW portrait of my grandfather Edward Smith and my uncles as youngsters in front of the Campbell's Coach House delivering Christmas Trees in their vintage red pickup to the Campbell family. Highlight ~ A few years ago, the restoration of the Coeur d'Alene Park (FriendsofCDAPark.org) band pavilion was completed. I gave the park stewardship organization permission to use my artwork (right) to raise funds for their organization. Learn more about the milestone 125th birthday celebration of Coeur d'Alene Park further down on this page. In the 1990s, I was honored by Lt. Governor Brad and Mrs. Linda Owen, advocates of Washington State's many diverse fine artists. Patricia M. Prince met me at that first ArtFest mentioned above and recommended my work to the Owens. She admired my portraits of settings from all over Washington State ~ and knew the Owens would find them a nice fit for the exhibit. They invited me to join several others exhibiting in Olympia's State Capitol Legislative Building. The opening of "Children at Play in Washington State" was followed by a reception attended by state dignitaries, legislators, visiting school children and more. Doug and I met Congressman Dino Rossi who later ran for the office of Washington State Governor. My husband Doug and I had been dating for just a short while and it was an honor to include him in the grand festivities. This exhibit and reception inspired my portrait (pictured to the left) of the stunning Legislative Building, "Happy Holidays at the State Capitol." When I finished this painting, Governor Gary Locke was in the midst of his second term of office. I gave both Governor Locke and Lt. 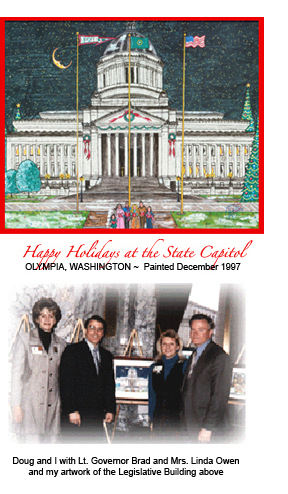 Governor Brad Owens framed fine art of this festive Holiday scene at the State Capitol. "Children at Play" was just one of four art events I appeared in during the 2000s. Heading up a committee of committed volunteers, the Owens worked hard to promote the work of local Washington State artists. The halls of the elegant Legislative Building proved to be a spectacular backdrop for the creative efforts of everyone involved and the setting did a great deal to promote the careers of many fine artists. Lt. Governor Brad Owen recently retired from a lifelong career of public service a few years ago. All of us who were involved with these creative ventures are very grateful him and his wife for their generous support. You never know what ripple effect the smallest gesture can have. In 1997, I finished a portrait of the four-story brick Victorian on Spokane's North Side that had once housed my high school. I filled the spring-themed piece with Holy Names sisters, educators and classmates as a tribute to four inspiring years at the Academy. My class of 1968 celebrated our 50th class reunion recently. Highlight ~ John Stockton, the famed Utah Jazz basketball player, grew up across the Superior Street from my high school. When Gonzaga Prep began accepting women students, Holy Names Academy and Marycliff High School (the other all-girls high school across town) just couldn't compete with Prep's co-educational platform. The declining enrollment caused the academy to close its doors in 1975. After ten-plus years of neglect, local developer Harry(Hank) A. Green renovated the abandoned building into an upscale uniquely beautiful retirement center that retained much of the original architectural detail. The Academy building has just been purchased by an upscale company from Salt Lake City who has committed to do a great deal more restoration work on the historic structure. In spring 2001, I sent an art card with my portrait of Holy Names to our beloved principal Sr. Eileen Rose at the Fort Wright Convent. Soon I heard from Communications Coordinator Becky Sullivan and the Director of Development Sr. Celine Steinberger (sadly this dynamic woman passed away recently on Christmas Day, 2017), asking if they could feature my artwork in a future publication devoted to creative alumni. My portrait of our high school was the cover art of the newsletter ~ quite a honor! 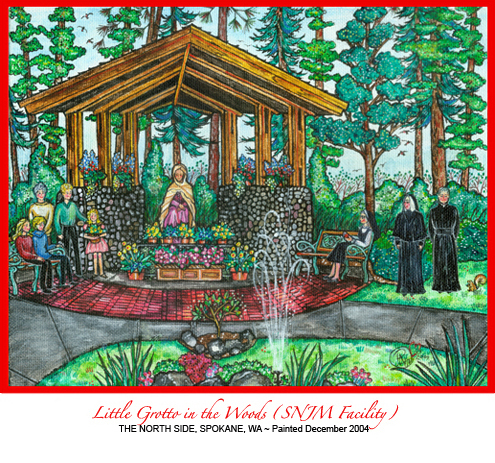 FOUR SEASONS OF HOLY NAMES ~ In summer 2013, I donated four framed pieces of the two Holy Names Academies in the Pacific Northwest province (Spokane and Seattle, Washington) and the convent grotto at what was once the sister's Spokane convent near For Wright. These gifts commemorated their 125th Celebration (more on this below) and are still hanging at the sisters' retirement home, recently relocated to the South Hill. SPRING ~ "Celebrating at Holy Names Academy" (2013) ~ This was a revision of the original 1997 painting featured on the newsletter cover here. I reworked it to commemorate the celebration of the sisters' arrival to the Inland Northwest 125 before. A framed print of this piece was also featured at the event's live auction. SUMMER ~ "Little Grotto in the Woods" (2001) ~ This piece portrayed the rustic shelter created by a group of volunteers to house the statue of the Blessed Mother at the Fort Wright Conven. The beloved statue had beenpart of the garden art at Holy Names Academy on Superior Street. High school principal Sister Eileen Rose and Father Tony Lehman, S.J. were included in the group pictured by the fountain. Sadly, both of these wonderful, inspiring individuals have passed away as well. FALL ~ "Autumn at the Academy Through the Years" (2010) ~ Seattle's Holy Names Academy alum Betty Chandler commissioned this portrait. Together we donated framed prints to Seattle's HNA annual auction over a four-year period. Students, parents and alums just loved this image featuring students on the sidewalk wearing school uniforms spanning several decades. WINTER ~ "Snow Chapel at Holy Names Academy" (2012) ~ After seeing the old Spokane school building blanketed in snow one winter, I was inspired to paint it a second time. Learn more about the dedication of this painting in "Awards, Art Directing, Dedications and More" below. A SPECIAL THANK YOU ~ I owe a huge debt of gratitude for the generous love and support the Sisters of the Holy Names have given me over the past 50 years. In addition to all of the activities, benefits and celebrations, when life has presented challenges, the first person I phoned for emotional support and prayers was dear Sister Celine. She has only been gone for about a year, but I miss her terribly. She and the sisters prayed for many special intentions ~ most recently, helping my husband Doug through some serious health issues including a lengthy 8-1/2-hour surgery. The sisters have been with Doug and me all the way throughout his challenges, sending their loving thoughts and prayers for his complete recovery. They are indeed "Angels on Earth." 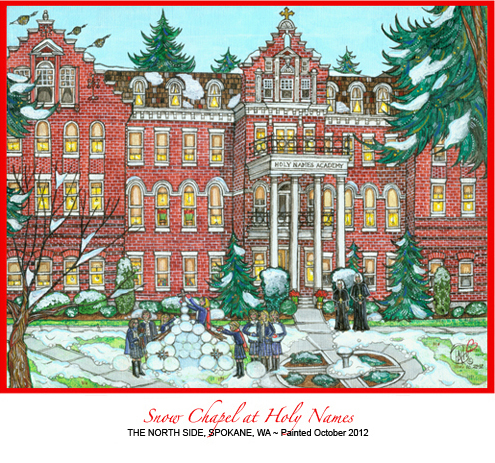 The Nativity image pictured in the pen, ink & pastels sketch to the right was featured on 2015 Christmas cards and holiday tree ornaments sent by the sisters to all the alumni. 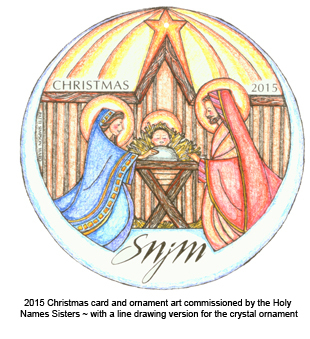 For those who were especially generous with their annual donations, a line-drawing version was etched on fine crystal ornaments produced by Seattle's Barone Crystal (BaroneCrystal.com). Address ~ Office of the Sisters of the Holy Names, Washington Province • 2911 West Fort George Wright Drive, Spokane, WA 99224 •Tel 509.328.7470 • Email ProvAdmin@SNJMuson.org. 2017-2019 ~ ART DIRECTOR,UPDATE NEWSLETTER, SPOKANE PRESERVATION ADVOCATES ~ In late December 2016, I met with outgoing SPA President Bridget Piper about polishing and updating some of the communication pieces this prestigious group produced to educate the public and promote their organization's goals of preserving historic Inland NW settings. This list includes many prestigious iconic buildings in Spokane's Downtown District and beyond. Bridget and I tossed around a lot of ideas, but the main one w agreed upon was that SPA needed a little assistance presenting a more polished professional image to the community, i.e. puting their "best foot" forward as the need for preservation grows, expenses expand and grant requests became more substantial. The goal was to help grow the organization and assure the public that SPA's goals deserved a substantial amount of attention and support to keep developers from destroying one-of-a-kind settings in the coming challenging years. My volunteer project was a complete revamping of the organization's quarterly newsletter UPDATE. Partnering with Executive Coordinator Dave Shockley who gathers and organizes the stories and images from contributors, we freshened up the look and feel of the newsletter ~ adding a table of contents, a revamped "Join Spokane Preservation Advocates NOW" page and presenting the images throughout UPDATE in a more compelling, graphically pleasing way. Our first revised issue was mailed out early in March 2017. Lots of positive feedback came our way about how great it looked and how easy it was to read and navigate. The 2018 SPRING UPDATE (my 9th issue) is pictured here with the cover image and article honoring one of Spokane's most unique, outstanding Kirtland Cutter residences, the Patrick Clark Mansion (largely known as Patsy Clarks) in Browne's Addition across from Coeur d'Alene Park. To read the newsletter, click on the image left. Highlight ~ NEW HISTORY BOOK! "The Life & Times of Patsy Clark • Mining Pioneer" ~ In December 2018, John Richards released his NEW definitive biography chronicaling the life of his great-grandfather. Filled with amazing information gleaned from John's years of research and paired with many proprietary family images (plus a color plate of my portrait of the mansion), this is a "must read"! For more information on Spokane Preservation Advocates and their activities and events throughout the year, please visit their web site (SpokanePreservation.org) . 2017-2019 (RETIRED) ~ ART DIRECTOR, FRIENDS OF THE MOORE TURNER HERITAGE GARDENS ~ The Moore-Turner Heritage Gardens were installed in the early 1900s on the hill behind the F. Rockwood Moore mansion. After his death, George and Bertha Turner lived there, but ultimately the home was given to the community. Tragically, it was demolished near the end of the Great Depression due to lack of funds for maintenance ~ a huge loss, as many believed it to be K.K. Cutter's first residential commission. In 1911, the Turners hired Portland's Hugh Bryan to expand their gardens up the hillside behind their home. Bryan installed a tea house, pergola, water features, basaltic rock terraces, ponds and more. Sadly, these gardens were a casualty of the Depression as well. The 1996 ice storm destroyed many of the trees where the gardens had been and and exposed many original features. The Corbin Art Center director discovered these, which led to an ambitious restoration project largely funded by philanthropist Myrtle Woldson. Volunteers joined with the Spokane Parks & Recreation Department and spent countless hours working to resurrect the gardens with heritage plantings indigenous to the era of their original creation. BIRTH OF "FRIENDS" ~ The stewardship organization "Friends of The Moore-Turner Heritage Gardens" (HeritageGardens.org) was formed to assist both the gardens and the Corbin Art Center. Flanked on the left by D.C. Corbin's mansion (now CAC) and the right by the F. Lewis Clark Mansion (Marycliff Catholic High School for a time after Clark's death), the gardens have become the jewel of Seventh Avenue ~ and the ONLY heritage gardens in Eastern Washington. In January 2017, I was invited to join the board as art director with the goal of revitalizing the "Friends" original viison created by an accomplished designer and art director who worked with a well-known national artist. (See the logo at the bottom of the poster.) Over the past few years, the "Friends" original identity lost much of its direction, so my task was to guide all communication pieces and accompanying images back to where they originally started. I worked very hard and spent countless hours over the last two years to achieve this. I wrapped up my responsibilities and retired from my position as "Friends" art director this February largely due to health challenges. Annually, in addition to summer garden tours led by "Friends" docents, the organization hosts two fund-raisers ~ a Traditional English Tea in Spring and Art In Bloom in Autumn. In 2018, the organization dovetailed their tea with the Northwest Museum of Art & Culture's (The MAC) Mother's Day Tour of Historic Homes. September's Art in Bloom paired fine art from 13 artists with floral creations by 21 designers and shops. I designed the poster (left) and graphics, as well as project managing the artists' portion of the benefit. Both events greatly benefitted the gardens. 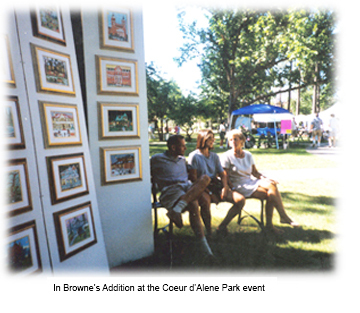 2014-2019 ~ ART DIRECTOR, FRIENDS OF COEUR D'ALENE PARK ~ As I shared above, Coeur d'Alene Park in Browne's Addition is the first and oldest park in Spokane. The Friends of Coeur d'Alene Park stewardship group's initial project was to repair andrestore the park's ageing onion-domed band pavilion. As mentioned above, I allowed them to use my painting "Pavilion at Coeur d'Alene Park" (pictured above) to assist with much-needed fund-raising. I became more involved as art director when it became clear that the organization needed a signature "identity" for their presence in the community as well as help with communications pieces for print and the web. My first task was to design a series of logos for different uses in varied media. 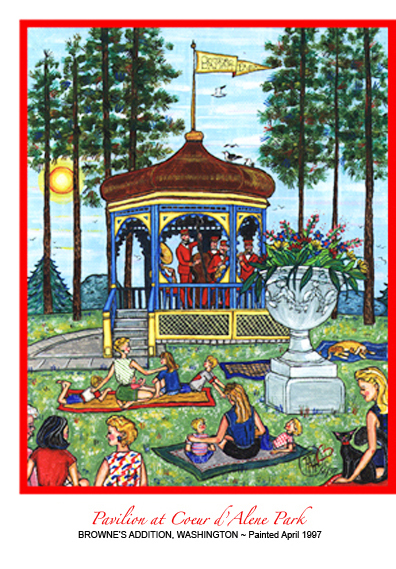 Next came their informational tri-fold, a poster with my painting of the band pavilion and a series of banners for use at fund-raising events and in their booth at the MAC's annual ArtFest. In 2014, The Friends of Coeur d'Alene Park (FriendsofCDAPark.org) presented much needed improvement plans to the Spokane Parks & Recreation Department. The goal was to help bring the park more in-line with the vision suggested in the 1890s by famed landscape architects Olmsted Bros. of Brookline, Massachusetts. 2016 marked the park's 125th birthday. 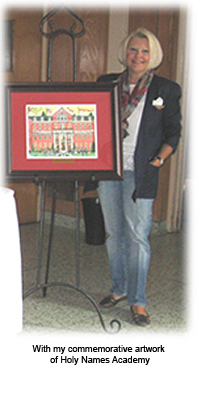 A kick-off benefit dinner was held November 7, 2015 at the Patsy Clark mansion where the park's new "Master Plan" created by Bob Scarfo and a special portrait I painted of how the park looked at the turn of the century were both unveiled. See "Vintage View of Coeur d'Alene Park" on the Inland NW Parks Collection pdf. "Art For the Park" in May 2016 brought more attention to CDA park with a multi-faceted community art event. I designed the logo, poster, signage, banners, brochures and postcards promoting the much anticipated "happening." Art For the Park featured four street intersection mural artists, creative activities for kids and a stable of juried, well-known local artisans set up around the park's famous band pavilion. September 10 ended the 125th birthday celebration at the MAC (Northwest Museum of Arts & Culture). My "Vintage View of Coeur d'Alene Park" original was awarded to the winning raffle ticket holder. Funds raised from the 2015-2016 events have helped with the improvements which have begun to take place at the park. Although recent health issues for both my husband and me have curtailed my participation with this group, I'm still able to help them out now and then as my schedule allows. 2012 ~ MY FIRST SPOKANE "FIRST FRIDAY" ART WALK ~ In November 2012, after moving back to the Inland Northwest, I unveiled my second portrait "Snow Chapel at Holy Names" (pictured above) at the E.J. Roberts Mansion's First Friday Art Walk. Mary Moltke still owned and managed the mansion at the time of this event, although she recently sold it after her long career as a successful innkeeper. She spent decades restoring the three-story Queen Anne beauty which was built in Browne's Addition in 1889. It became a hugely popular, much sought after destination as both an inn and an event centerr. 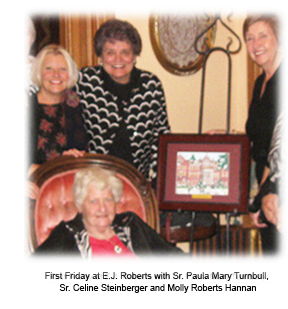 She hosted this First Friday and unveiling, joined by our mutual friend Molly Roberts Hannan, great-grandaughter of E.J. Roberts. Mary has gone on to embrace her new-found free time. The First Friday invitation was timely as Spokane was in the midst of the National Historic Preservation Society Convention. This event also dovetailed beautifully with the nationally sponsored Candlelight Sumner Avenue Tour of historic homes. First Friday was attended by lots of HNA alumni and Holy Names Sisters. These included Sister Celine Steinberger (standing next to me) and Sr. Paula Mary Turnbul, who passed away last summer after an internationally famous fine art career). My pal Molly Roberts Hannan is to the right. This was just another special occasion when Sister Celine was on hand to support me. How lucky was I? Since this initial First Friday Art Walk, my work has been featured at Barrister Winery, Markeplace Winery, Arbor Crest Cellars, Grande Ronde Cellars, Lindaman's Bistro and several other venues. 2010 ~ WINNER 1ST PLACE! 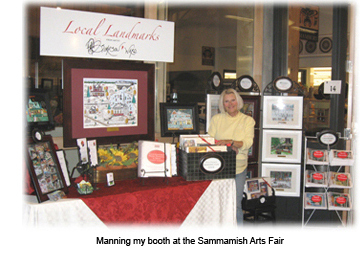 RSM FINE ART COMPETITION ~ Although I retired as an active member of the Redmond Saturday Market in 2011 (my fifth and final year), I'm proud of the artwork I painted and the poster I designed promoting its 35th season. This beautiful venue is in downtown Redmond on a grassy area next to a grove of tall pine trees that provide much needed shade during the sometimes blistering summer market months. 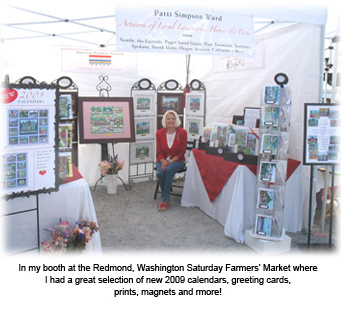 The Redmond Saturday Market board chose "Meeting at The Market" (pictured below in my "Patti Simpson Ward in The Press" section below) as 1st place winner in their competition for the best image capturing the RSM experience. It showed vendors, shoppers and families with pets enjoying a sunny Saturday. Dozens of posters featuring my painting were displayed throughout King County's Eastside from May 1st through October 31st, 2010 ~ encompassing the entire market season. I've shared the article published about me in the Redmond Reporter, also below in the "Patti Simpson Ward in the Press" section. To learn more about this popular Western Washington outdoor venue (second only to Seattle's Pike Place Market), visit them on the web (RedmondSaturdayMarket.org). The city, arts commission, artists and patrons were all generous with their appreciation of the months of the hard work. The event was a huge success with attendance up nearly twice as much as the previous year. 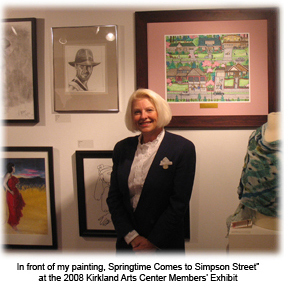 2008 ~ KAC MEMBERS' EXHIBIT ~ In August 2008, my painting of "Springtime Comes to Simpson Street" was chosen for the Kirkland Arts Center (KirklandArtsCenter.com) Members' Exhibit (see the art on my Commission page). It showed a "neighborhood" of homes I've lived in and loved over the years. This painting has always been "fluid" as new family members are added and changes happen to the homes. I'm working on a fourth revision to add our most recent grandkids Nathan Davies and Piper Elizabeth Ward. The upper street depicted Spokane years growing up in the Lincoln Street cottage and the Codd House on Spokane's South Hill before our family moved to the Spokane Valley suburbs. The lower street pictured Doug and my home in Sammamish and the 1937 Spokane craftsman we moved into in January 2012. The Peter Kirk (namesake of the community of Kirkland) Building, an ornate three-story brick Victorian, houses Kirkland Arts Center. This wonderful venue hosts exhibits and offers art classes covering nearly on all artistic genres. To see my portrait of this vintage community icon and learn about its interesting local history, find it in the Kirkland section of my Eastside Collection pdf. When I first joined KAC, the organization had a second location in the nearby Parkplace Mall where artists and instructors displayed and sold their work ~ a great venue for KAC folks to showcase their talents. It closed in autumn 2015 when the mall began a comprehensive renovation. We all miss that special space! 2008 ~ WINNER 2ND PLACE! ~ in Mid-July, honoring the community as "The Biking Capitol" of the region. Three Redmond art- and history-oriented organizations (Eastside Association of Fine Arts, Redmond Arts Commission and the Redmond Historical Society) sponsored a competition for artwork and photography honoring Redmond's history during the annual community bike-oriented summer festival. 65 pieces were hung (four of them mine) in the Old Redmond Schoolhouse Community Center. 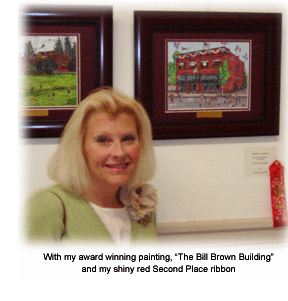 My "Bill Brown Building" painting took 2nd place. It went on to be exhibited alternately between Redmond City Hall and the Redmond Public Library for over a year. The Eastside Collection pdf shares my Redmond Collection ~ including the award-winning Bill Brown painting pictured here. In 2012-2013, I designed five large format historical banners for the Redmond City Hall through my association with Redmond Historical Society. For more information on this active group, find them at RedmondHistoricalSociety.org. 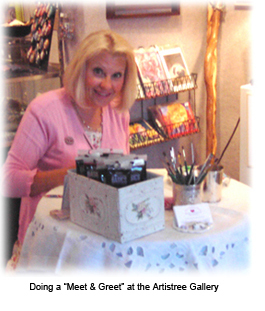 1990-2007 ~ THE ARTISTREE GALLERY, COUNTRY VILLAGE ~ From 1990 through the late 2000s,The Artistree Gallery was operated by the late Bob James and his two daughters Robin and Wendy at Country Village in Bothell, WA. The collection of shops, galleries and cafes were housed in refurbished farm buildings ~ creating a charming destination for folks of all ages to enjoy a leisurely day of shopping. The family's patriarch Bob James was renowned for designing the massive star and signature holiday decor for Seattle's Bon Marche (now Macy's). His equally famous daughter Robin earned a reputation as a talented illustrator for the much loved Serendipity children's books ~ still available today. I was one of several artists with an ongoing revolving exhibit at the Artistree ~ displaying there for over ten years. The gallery showcased my collections of paintings of Roche Harbor, Port Townsend, Snohomish, Seattle and the Eastside communities of King County and beyond. Country Village and The Artistree came alive at Christmastime with strolling carolers, festive decorations, holiday open house and more. The one at the Artistree was especially festive with lots of holiday-themed artwork. Santa arrived on his sleigh in the plaza eliciting ooohs and aahhhs from all the kids. It was a fun decade and the James family was a dream to work with. You'll find my portrait of the Artistree Gallery in the North Puget Sound pdf. NOTE ~ Sadly, at the writing, I've learned from my sister Marilee who lives in the area, that beloved Country Village has been sold to a local developer for a large new mixed-use project. It will be missed by everyone in nearby communities and beyond. SCHEDULE OF UPCOMING EVENTS ~ Visit my Art Venues page for a complete schedule of upcoming venues. This page is changes frequently as events are added throughout the year. You'll find details on Spokane First Friday appearances and other annual events like the Arbor Crest Art & Glass Fest, Kendall Yards' Artisans' Fes ttand many others. There is also a list of shops and galleries that carry my artwork locally in the Inland Northwest. 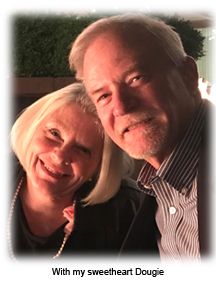 MY SWEET HUSBAND DOUG ~ For loading and unloading boxes and fixtures, hanging paintings at First Fridays, outdoor event tent set-ups, coffee runs and other tasks too numerous to mention ~ Dougie's my special "Angel on Earth"! 2017 ~ THE SPOKESMAN REVIEW ~ "Art In Bloom: Back Porch • Artists, Floral Designers in Art In Bloom Hlep Moore-Turner Gardens, Corbin Art Center" ~ Above on this page under the "Art Directing, Unveilings, Awards & More" section, I shared details about Friends of the Moore-Turner Heritage Gardens. 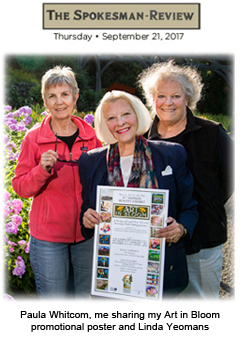 As I noted above, this non-profit stewardship group hosts two benefits each year ~ "The Traditional English Tea" and" Art In Bloom" ~ raising much needed funds for the Moore-Turner Heritage Gardens and adjacent Corbin Art Center on Spokane's Lower South Hill. No longer a quilt display as in past years, in 2017 and 2018, the pairings were composed of an exhibit on the first floor of the Corbin Art Center pairing works by well-known local artists with arrangements created by talented florists. Additionally, there was a benefit raffle of donated items from all 13 fine artists. Instead of Artisan Vendors on the windblown veranda of the mansion, they sold artwork and more from booths on the second floor of the Corbin Art Center. Shown above is the poster featuring sample images from each of the selected juried artists. The 2018 5th Annual Art in Bloom took place on September 21-22, 2018. Pictured here are the gardens' lead docent Paula Whitcom, me (Friends of The Moore-Turner Heritage Gardens Art Director) and Communications Chair Linda Yeomans (also Spokane "Historian Extraordiniare"). NOTE ~ Linda is the "go to" gal if you are interested in having your home listed on the Spokane, Washington State or the National Historic Register. 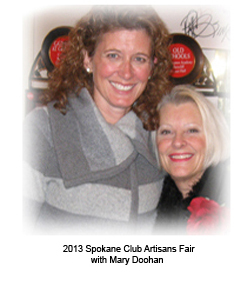 Click on 2017 The Spokesman Review Art in Bloom Article pdf to see more artwork images and to read Pat Munt's story about our event ~ including the sudden passing of beloved Diane Zahner, Art In Bloom participating artist for two years. 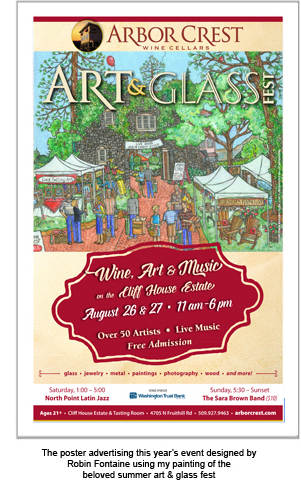 2017 ~ ARBOR CREST CELLARS ART & GLASS FEST ~ The artwork featured prominently in this poster is my painting of the Arbor Crest Cellars Art & Glass Fest with the historic Gatehouse (once the servants' quarters) in the background. It pictures family and friends enjoying this much anticipated late August event. The poster was designed by Robin Fontaine (Crispy Communications) to promote the festival throughout the communities of Spokane, Spokane Valley, Coeur d'Alene and beyond in 2017. Robin also used this image in a print ads placed in the July and August issues of the The Inlander ~ a huge honor for me last summer. Arbor Crest Art & Glass Fest features over 75 talented juried artisans. 2017 marked my 5th year of participation in this special event and the second time that my art was used to promote it ~ the first time in 2015 with my portrait of the Cliff House. Live music plays during the day Saturday with a well attended evening concert at the close of the event Sunday evening. It's always a wonderful time for both artisans and patrons. The fine wine and beer makes it even better! ROYAL RIBLET ~ In 1924, owner Royal Newton Riblet built the Florentine-style mansion to take advantage of the spectacular view from the cliffs of his property. An inventor and mechanical genius, his estate was filled with marvels for its time like a mechanical garage door, a waterfall that recycled water back to the top of the falls and his unique "square wheel." His most famous invention was the chair-lift. Up to that point, skiers around the world relied on T-bars, rope tows or just climbing back up the mountain. Riblet visited a mine site and was inspired by watching full ore buckets traveling on a belt from the mine down to the ore cars below, being emptied and then sent back up on the belt to be refilled. Today the majestic Cliff House is an event center. The grand estate with its picturesque grounds that house Arbor Crest Cellars is owned by the Harry Milke family. This Christmas, the mansion will host its third annual holiday art event. Visit my Art Venues page for more information. Highlight ~ When Royal Riblet was living at Cliff House, the cement factory below on the riverside spewed harmful dust fragments into the air, deteriorating his mansion's facade. He sued ~ and the attorneys who won the first ever case of its kind were associates James Winton and my father Joseph A. Simpson. 2016 ~ CONTEMPLATE NEWSLETTER ~ Published by the Franciscan Sisters of Perpetual Adoration headquartered in Wisconsin, the article "Sister Rita Mae: Furthering FSPA's Mission of Education" came out in the December 2016 issue. Click on the "Contemplate" image here or on Contemplate pdf to read it. 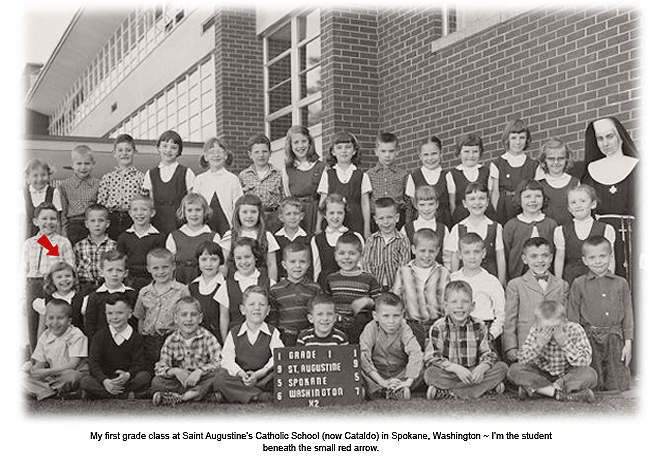 It featured my first grade teacher at Saint Augustine Grade School (now Cataldo Catholic School) in Spokane, WA. I have been in touch with this inspiring woman who has touched my life for many decades. She is pictured in the 1956 class photo at the top of this page ~ to the right of her students wearing her Franciscan habit (as the sisters were still doing in the 1950s and 1960s). 2013 ~ DODSON'S PROMOTIONAL POSTCARD ~ This went to all the folks attending the Spokane Symphony performances during the Holiday Season, 2013. 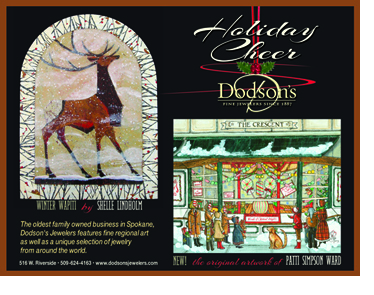 Dodson's owners Penn and Deborah Fix hosted Holiday and Winter-themed artwork exhibited by several talented well-known local artists at their downtown shop on Riverside Avenue. Of the 10 originals they chose from my Spokane Collection, "Vista House View" and "Cavorting at Cannon Hill Pond" were purchased that year by Pat and Kathleen Dix. The couple later commissioned a portrait of their lake cabin on Hayden at Sunset Beach near my brother Bob' place. 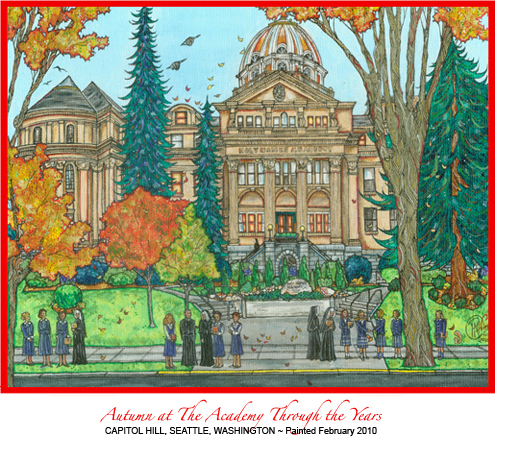 In 2014, Dodsons invited me back and featured 13 of my works including portraits of the Spokane County Courthouse, a Christmas Eve rendition of Saint Augustine's Church, Mount Spokane's historic Frances Cook cabin and lots of Holiday wieces like "The Crescent Window at Christmastime" pictured here. STORE CLOSURE ~ After three generations of owners and decades of doing business in the Inland Northwest, this beloved jewelry store closed its doors forever December 2018. This fine establishment will be missed by many loyal Spokane customers. 2013 ~ ENTERTAINMENT SPOKANE NEWSLETTER ~ In November 2013, the Arbor Crest Cellars Tasting Room at River Park Square mounted an exhibit of 35 of my seasonal works beginning with a First Friday "Meet & Greet." 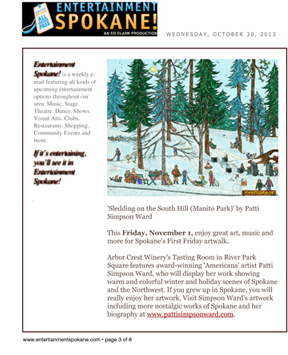 Ed Clark produces a weekly newsletter about what's happening in Spokane called Entertainment Spokane, (EntertainmentSpokane.com). His October 30th issue featured a wonterful article about my event. My exhibit focused on local winter and holiday scenes similar to the Dodson's exhibit ~ but with 25 additional pieces. Themes included Magical Spokane Memories, Christmas at the Campbell House, Home for the Holidays (residences decorated for the season), Gathering at Gonzaga University, Santa in Scotland (holiday golf-themed) and Mount Spokane & Manito Park. I unveiled my NEW artwork of the Manito Park sledding hill on the corner of 18th Avenue & Grand Boulevard (pictured here in the Entertainment Spokane article). It featured friends and families in a mid-1950s scene enjoying a crisp, winter day after a fresh snowfall. This work brought back very fond memories for lots of Spokane "baby-boomers." The setting is much the same today. 2013 ~ SNJM WASHINGTON PARTNERS IN MISSION MAGAZINE ~ The fall 2013 issue included a photograph of me with my commemorative painting of Holy Names Academy in a collage of photos on page 10 of the newsletter. 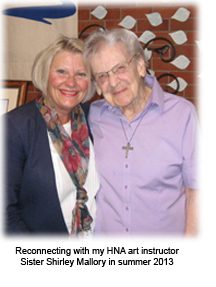 As I shared above on this page, I reworked an earlier portrait of HNA to create "Celebrating at Holy Names." This revised piece honored the Sisters' arrival to the Inland Northwest 125 ago with students and educators in the foreground and a streamer above wavng our school song,"O Holy Names we sing thy praises..."
As pictured above, I donated prints of the "Four Seasons of Holy Names" to the sisters for their retirement facility. My dear friend and accomplished local artist Jeannine Marx Fruci had just completed a beautiful watercolor of the academy and she gave them a framed work as well. We were both inspired by wonderful memories! All five images were on display throughout the weekend celebration. In addition, the artwork that both Jeannie and I donated to the auction portion did well and brought in much needed funds for the Holy Names music school and the sisters' care. 2010 ~ REDMOND REPORTER NEWSPAPER ~ As I mentioned above, my painting of "Meeting at The Market" won first place in the Redmond Saturday Market artwork competition. This colorful work featured a border of fresh fruit, vegetables and flowers with arts & crafts vendors and shoppers in the scene. After winning, the market board of directors invited me to design the promotional poster for the market's 35th season (pictured here). I met with Redmond Reporter staff writer Mary Stevens Decker for an interview ~ our second in four years. We spent a half hour at Redmond's Soul Foods Bistro catching up as there had been lots of changes in both of our lives. Ms. Decker wrote a glowing full-page piece with a photo of me and the image of my poster pictured here advertising the milestone season of this beloved Redmond outdoor venue. 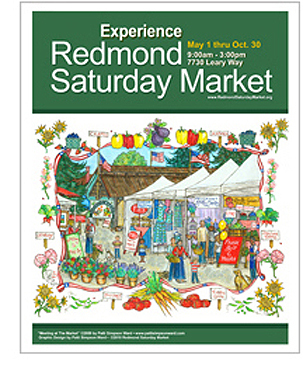 Click on Redmond Reporter II pdf or the poster here to read "Meeting at The Market ~ Local Artist spotlights upcoming Saturday Market in Promotional Poster." 2007 ~ 425 MAGAZINE HOLIDAY ISSUE ~ In 2007, I was invited to appear with 11 other fine artists in 425 Magazine's Holiday Issue in a beautiful full-color spread entitled "12 Days of Christmas Cards." The magazine celebrates the ever-burgeoning city of Bellevue and other Eastside communities (east of Seattle and Lake Washington) in the "425" area code. To read the article, meet the artists and see the collection of Christmas card artwork, click on the image to the left or on 425 pdf. For more information or to subscribe, visit 425Magazine.com. 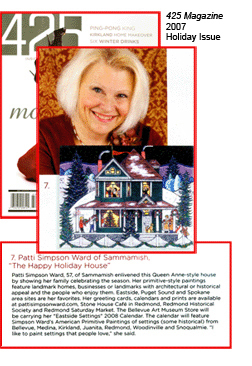 "Happy Holiday House" portrays the Queen Anne-style Harmon House located in the heart of the Snohomish historic district. To read about the history of the house, click on Snohomish Collection pdf. A 30-minute drive north of Seattle, this community is filled with restored historic residences built in the late 1800s. It's a great "get-away" destination with B&Bs, restaurants, gift shops and antique emporiums for keen-eyed shoppers. As I've painted portraits of 27 Snohomish residences, many friends have come my way through my association with the historical society (SnohomishHistoricalSociety.org.). I was invited to do several "Meet & Greets" during their September and December Tours of Historic Homes when Doug and I lived in Sammamish in the 2000s. 2006 ~ REDMOND REPORTER NEWSPAPER ~ When the Redmond Historical Society asked me to join their board, Renee DuVal-Northern approached the organization for help with historic photos for her Stone House Cafe. This was fitting as the restaurant was housed in a unique stone and brick cottage built at the turn of the century. I offered assistance with this project and shared that in addition to being an art director/graphic designer, I was also a fine artist. 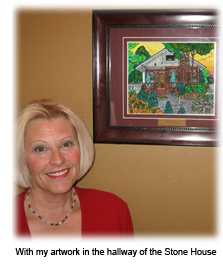 Renee purchased a print of her historic Stone House. When she opened her restaurant, the Redmond Reporter published a two-page pictorial about the unique setting. She shared my artwork with staff writer Mary Stevens Decker, who phoned me for an interview. Click on Redmond Reporter pdf to read the article, "Redmond Spotlight: Artist Sees Beauty in Old Buildings." Later, the business was purchased in 2010 by restaurateur Ryan Donaldson who was featured several times on Seattle's KING TV's Evening Magazine. Chef Ryan became famous for his Northwest cuisine, local wines and spirits ~ building a very devoted following. Ryan also purchased a print of "The Stone House" for his establishment and hung it prominently in the main dining room just before Doug and I left the area and moved back to Spokane. I'm passionate about giving back. It's the least I can do with all of the support I've received over the years from friends, clients and generous patrons. WESTERN WASHINGTON ~ I was one of the original founding members of the Eastside Heritage Center in Bellevue and served for eight years on the board of the Redmond Historical Society. I freelance designed many of the graphics and historic banners for the city of Redmond's 100th birthday in 2013. EASTERN WASHINGTON ~ As I mentioned above, I serve as the volunteer art director for a number of non-profits including Spokane Preservation Advocates, Friends of The Moore-Turner Heritage Gardens and Friends of CDA Park in Browne's Addition. I have also been an active member of the MAC (Northwest Museum &Culture) for nearly 20 years. I donate my fine art to many Spokane Inland Northwest benefits and silent auctions. One of my favorites is the Spokane Synphony's much anticipated Christmas Tree Elegance. 2018 marked the 6th year that my artwork was featured (Tree #5) at this Holiday extravaganza at the historic Davenport Hotel. Look for more 2019 listings below as the year unfolds. JANUARY ~ NW AGG (Associated General Contractors of Ameriac ~ Education) ~ "Flying South Over Spokane Falls (Monroe Street Bridge)"
FEBRUARY ~ Saint Aloysius Parish Benefit ~ NEW "Gathering at Gonzaga Prep"
FEBRUARY ~ South Side Christian School ~ "Davenport Fountain at Duncan Garden (Manito Park)"
APRIL ~ Junior Golf's First Tee ~ "Hayden Lake Country Club"
JULY ~ Spokane Symphony's Mozart on a Summer's Eve at Manito Park ~ NEW "Romantic Rose Hill (Manito Park)"
OCTOBER ~ Spokane Parks & Recreation Department's Moore-Turner Heritage Gardens AIB ~ "Marriage at the Moore-Turner Heritage Gardens"
I've also donated artwork to the Redmond and Sammamish Chambers of Commerce. As I mentioned above, my favorite charity is the retirement fund for the Sisters of the Holy Names. MY ART & DESIGN STUDIO ~ When Doug and I were married in 2000, his wedding gift to me was my art studio ~ a huge luxury after the cramped quarters in my small Seattle Capitol Hill condominium. Natural light floods this space, which overlooks our back yard and gardens (lots of inspiration there). During our remodel, our contractor Lance Elliott created a built-in armoire from shelves and an old beat-up kitchen cabinet we found in the garage. All my art/design books, laptops for digital designing and painting supplies are at my fingertips. The vintage porcelain laundry sink is perfect for cleaning canvases and paintbrushes. PITTYPAT GALLERY ~ CLOSED ~ The gallery is typically open by appointment and invitation from June through December and features a revolving exhibit of framed originals and canvas reproductions that changes with the seasons and dovetails with my web site. I offer a full selection of prints (both canvas and high-grade art paper), art cards, calendars, fine art journals, magnets and more. I also periodically host invitational events with special discounts for V.I.P.s (Very Important Patrons). To be on the list, please contact me. NOTE ~ I absolutely NEVER share your personal information. Doug and I married in 2000 ~ 19 years this April. How time flies...and yes, we are having fun even though the past two years have brought both my husband and me some daunting health challenges. A huge thank you to all our friends who have been such a huge support. Doug is doing well and is in great spirits ~ fighting the good fight thanks to his team and monthly treatments at Houston's M.D. Anderson. I am slowly but surely becoming more ambulatory after breaking my ankle in a terribly accident last September that required surgery, screws, a metal plate ~ and a long rehabilitation. Regardless, I've been with Dougie at most of his treatments and we are racking up frequent flyer miles. More importantly, his health is improving and he is #1 in his clinical trial after nearly a year. Each day is a gift! Most importantly, Doug feels great these day and is making the most of his talent as a "scratch" golfer. He loves the comraderie and competition of the sport as much as I love creating my artwork. We both do our best to support each other's passions ~ promises we made in our wedding vows. But, nothing would be possible without Doug's love and support. I'm SO blessed. He encourages me in a hundred little ways ~ from playing chef when I'm buried in design/production projects to helping me hang my paintings at First Friday Art Walks to loading and unloading crates, fixtures and all the trimmings at art fests and exhibits all over the Pacific Northwest. The ultimate sacrifice? When I'm really stretched to the limit, he's given up a golf game or two. He helps me believe nothing is impossible. We both enjoy life Spokane after a dozen years together in the Seattle area. With family nearby, (who all adoreDoug), five grandchildren a short drive away, wonderful friends that bless and enrich our lives every day ~ what could be better? It's a WONDERFUL LIFE!